1) I believe that they can. If they tell people they going to re-launch BS as action figure, people will be willing to wait. 2) I am not sure, but I think the earlier the better. Klinkin wrote: I really don't see why people are saying Koto's trying to kill the Busou Shinki line. Have you seen how the FA Girls line is doing? If anything, Koto making Busou Shinki like the FA Girls line is them trying to duplicate the success of one of their better model kit lines using a pre-existing IP that was said line's spiritual precursor. Everyone has their own opinions on model kits versus action figures, but you can't deny that Koto's model lines sell. Quite well. Also, for the record, Bandai's HG MS Girls are probably in response to Koto's various mecha musume kits, not the other way around. It seems you haven't read properly my previous comments. No one here denies the success of FA and MD, but here's the point; adding more mecha musume model kit line will end up as self-cannibalism by Koto, not to mention Bandai (and soon another comnpany) joining the market which will just end up as over saturated. 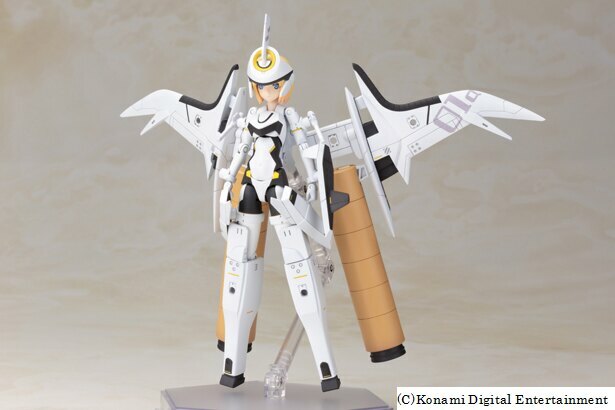 On the other hand, considering how the mecha musume action figure market is barely exists and have only one product line, the competition will be far easier and the customer base will be bigger (action figure have way bigger market of consumers then model kits), furthermore you could avoid the possible bad outcomes which I mentioned above. So as you see, it's not just issue of action figure vs model kit as in my personal preference, but also an issue of rational conclusions seeing how the market is. Dont see any release dates there, though. Some pics of the new Arval are up on webnewtype. That´s classic arnval for ya! But the first prototype pics that appeared online show tranche parts.... Maybe an expansion kit in the future? looks nice i'll admit... but what's her theme anyway?? ?